There is something new at the Shangri-La Plaza! This July, the metro’s premier lifestyle destination commemorates the 61st annual Filipino-Japanese Friendship month. All set is a roster of exciting activities and exhibits highlighting Japanese history, art, and lifestyle. To start off, there is the Eiga Sai film festival which will run until July 16. A line up of award-winning Japanese films of different genres is scheduled for showing at the Shang Cineplex Cinema 2. A showcase of the colorful heritage of Japan through their cultural artifacts with Yuujuo: A Japanese Cultural Exhibit will follow. This will be staged at the Level 3 of the Main Wing. Also, get to discover the Japanese art of stone appreciation through the Suiseki Exhibit. Here, the Natural Stone Society of the Philippines will display different collections of Japanese stones that reflect objects of nature interspersed with specially cultivated bonsai pieces. To catch the exhibit, just drop by the Grand Atrium from July 17 to 26. There will also be workshops like the History of Suiseki: Identifying Good Suiseki by Tonette Gedang on July 22 at 2 pm and Base Making for Suiseki by Sonny Armamento on July 23 at 2 pm. The metro’s premier lifestyle destination has also scheduled Japanese-themed workshops for the whole family. On July 15 at 4 pm at the East Atrium is the Kyosendo Workshop by the Saturday Group of Artists. On July 16, on the other hand, there will be a Bento Making Workshop. If only I could travel and go malling, I would attend this bento making workshop. It will be by Bento by Kat and Kimono Ken at 3 pm at the East Atrium. I have once attended Kat’s bento class and she is indeed generous in sharing her ideas. On the same day, July 16, Mark Floro in partnership with Canon, Sumosam, and Akira will conduct a Japanese Food Photography Workshop. It will be staged at the Grand Atrium at 4 pm. The following weekend, on July 22, the Japanese festival continues with the Sashimi Cutting Demo with Watamidrop. It will be held at the Grand Atrium at 5 pm. Finally, experience a traditional Japanese marketplace at the Everything Japanese Lifestyle Fair. Brands at the Shang, including The Bakeshop by EDSA Shangri-La Manila, Bonsai Shop, Daiso, Lollipuffs, Matsuri! Matsuri! The Kimono Shop, MUJI, National Bookstore, Owndays, Paul Frank, Powerbooks, Q Power Station, Suiseki Stones, and Toys R’ Us, as well as other select exhibitors, come together and offer mall guests a range of Japanese goods, from food favorites and household items to arts and crafts materials. Catch the fair from July 14 to 23 at the Main Wing, Level 1. You see, you need not book a flight to the land of the rising sun to get a feel of Japanese history, art, and lifestyle. 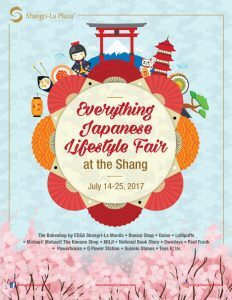 Visit the Shang this July to discover more of Japan’s rich heritage and the ways it’s interwoven into Filipino culture. OMG Bento Making!!!!! Japanese really treat food very well. They even merged it with art hence, the ~*kawaiiii*~ bento. hehe. I actually wanted to try it so I can showcase it at work. Seems like this is the right time to learn. I hope though that the materials aren’t that expensive since you will need a lot of different cutters. This event is really nice and great for Japanese culture lovers. I have heard Japanese have rich heritage. I’m sure this event will be loved and look forward by those who love their culture. Thank you for sharing. It has always been a dream of mine to visit Japan. It’s so rich in culture. It would be amazing to visit during this festival. Val and I have always been fascinated with the Japanese culture. Thus we planned that in case we decide to live abroad, we would have Japan on top of our list. I hope they would have these type of events here in Bacolod too as we are very much interested in attending. It sounds like a great event, I love Japan and their culture and food. I have actually just missed a similar event in London the other week because I was away. However, I’m sure they will put something on for the World Travel Market this year as well. The food photography workshop sounds so useful, especially for bloggers who work often with restaurants. Ooooh, I love Japanese EVERYTHING. I’ve been to Japan before, which made me love the country and everything in it more. I really hope I could go to this event! :O <3 Too bad I've been really busy with school these days. Too bad I just read about this now> I would love to attend the Bento workshop. I am excited to prepare my baby’s meal when he goes to school one day. 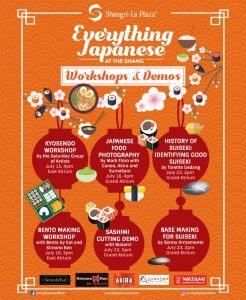 Plus the other workshops will surely interests even my husband because those are Japanese-related and he just loves their culture. I love anything Japanese. I love their culture, their traditions, their festivals and their lifestyle. I would love to attend events like this and know more about Japanese food like sashimi, sushi, and bento making. Would love to learn more about origami too. That’s great! Tasting the Japanese culture without traveling 🙂 It would be cool if they had this in Sweden too. Enjoy it to the fullest when in PH!